Whether you're on the road for business or vacation (or due to a power outage), the good news is that there are lots of options to hook into the Internet, with public Wi-Fi hotspots at coffee shops and libraries, and Wi-Fi clouds and hard-wired lines in hotels. But you don't necessarily want to be sharing your device over public Wi-Fi, and one hard-wired connection is limited in these days of laptops and smartphones and tablets. 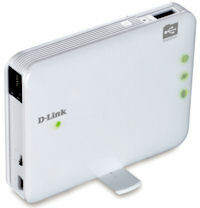 The D-Link Shareport Go is a portable mini router with the flexibility to turn a wireless or wired network connection into your own private Wi-Fi cloud -- to share among multiple devices (typically up to 5 users), at speeds up to 150 Mbps with 802.11n. It also has an auxiliary USB port, so you can plug in a USB drive to stream media and share files wirelessly to your mobile devices. You can access the drive using your device's Web browser app, or with the free SharePort Mobile app for iOS or Android to browse, play media, view files, and upload photos to the drive. In Router mode, the Shareport Go serves as a wireless router. Plug in a network cable, and it converts the connection into your own private Wi-Fi hotspot to share among multiple devices (and a USB drive). In Hotspot mode, the Shareport Go connects to an existing Wi-Fi hotspot, and again creates your own private Wi-Fi cloud from the connection. It also can be set up as an access point / repeater to extend an existing wired or wireless network, so that you can access resources on the network over wireless (instead of being isolated in a private cloud). The Shareport Go is compact and portable, at around 4 x 3 x 1 inches and 1/3 ounce. It includes a rechargeable battery for up to 4 hours of use -- and you even can use it as a charger for your smartphone. But even with the small size, this is a full-up network router. You can use the Quick Setup options to get it going (through a browser or the Quick Router Setup app), including creating a second public hotspot for visitors, separate from your private cloud. And, as you might expect from a D-Link product, it also has the advanced and administrative setup options familiar from office routers, including virtual server, VPN, filtering, and encryption options. The portable SharePort Go is available for around $89. The SharePort Mobile Companion has the same features in a wall-plug design for around $46. See my update on holiday gadgets -- Portable Accessories - Holiday 2012 -- for more on portable devices and accessories. This entry posted on November 3, 2012. Previous: Apple's iPads are Ready for the Holidays.